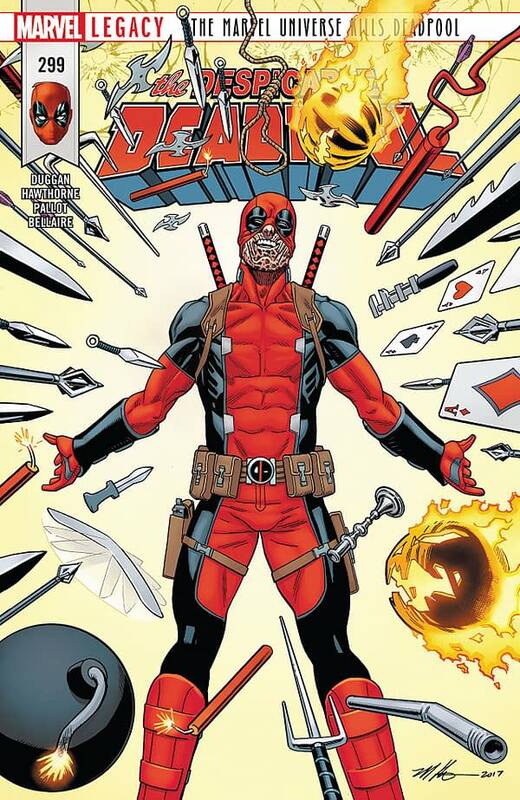 We’re one issue away from the historic Deadpool #300, and two issues away from the less historic rebooted Deadpool #1. 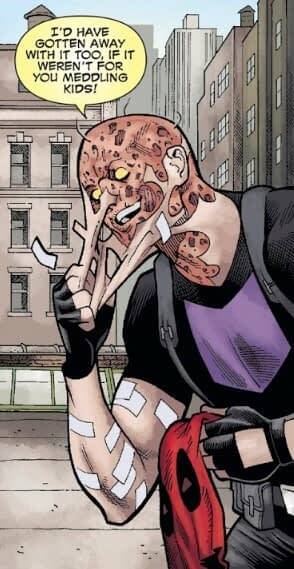 The recap page for Deadpool #299, which features a cartoon Deadpool drawn by Irene Lee recapping previous events, has become something of a favorite here at X-ual Healing, as it usually does a pretty good job of bringing readers up to speed. This one is a bit more introspective than usual, but it gets the point across: everyone hates Deadpool because he’s been doing “despicable” things since Secret Empire, and Deadpool hates himself because everyone he cares about gets hurt because of him. This issue, part three of the Marvel Universe Kills Deadpool storyline, opens with former Shield Agent Linda pouting in her living room while her husband complains that she needs to get a new job (S.H.I.E.L.D. 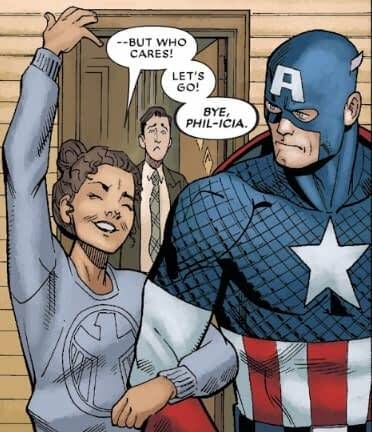 was disbanded when Captain America turned into a Nazi). Her husband opens the door to head to work, only to find Captain America waiting outside. Turns out he has a job offer for Linda, who ditches her nagging husband to help cap repair the damaged life model decoy that houses the consciousness of Deadpool’s friend, Agent Emily Preston. 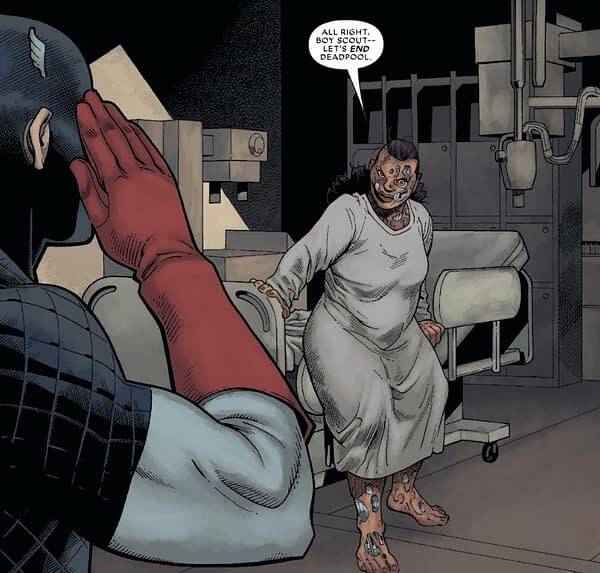 In a previous issue, Deadpool said he’d turn himself in if Cap saved Agent Preston, since it’s Cap’s Nazi alter ego that caused all of this in the first place. Back at the headquarters for the newly formed Deadpool Task Force, Maria Hill, Hawkeye (Clint), Speedball, 3D-Man, and a bunch of cannon fodder cops are plotting to take Deadpool down. Hawkeye (Kate) shows up with a second Hawkeye (Clint), prompting the first Hawkeye (Clint) to declare the second is a Skrull and fire an arrow which wildly misses. We know Hawkeye (both Clint and Kate) never misses, so the first Hawkeye is outed as Deadpool in disguise. He jumps out the window to escape as the Hawkeyes pursue. A scuffle ensues, with Hawkeye (Kate) wondering how Deadpool could kill Agent Coulson. Deadpool, correctly, blames Nazi Captain America and the fact that he had to protect his daughter during Secret Empire. Deadpool points out that he protected the Hawkeyes from Hydra during that ill-conceived super-mega-crossover event, something we’ll have to take his word for because we’re never reading it, as they crash through a skylight into a bathroom. Wade claims he did his part to take down Hydra, then smacks Hawkeye (Kate) with a toilet seat. The owner of the bathroom enters to find out what all the ruckus is, giving Deadpool the perfect hostage to make his mistake. Later, Hawkeye (Clint) and Hawkeye (Kate) explain that they let Deadpool escape to Maria Hill. The Hawkeyes are feeling sympathetic toward Deadpool, but Hill calls them fools. In space, former Shield Agent Adsit (now a commander of the Nova program), a former friend of Deadpool’s, learns that both Agent Coulson and Agent Preston are dead, with Deadpool listed as their murderer. He decides to head back to Earth, presumably to kill Deadpool. 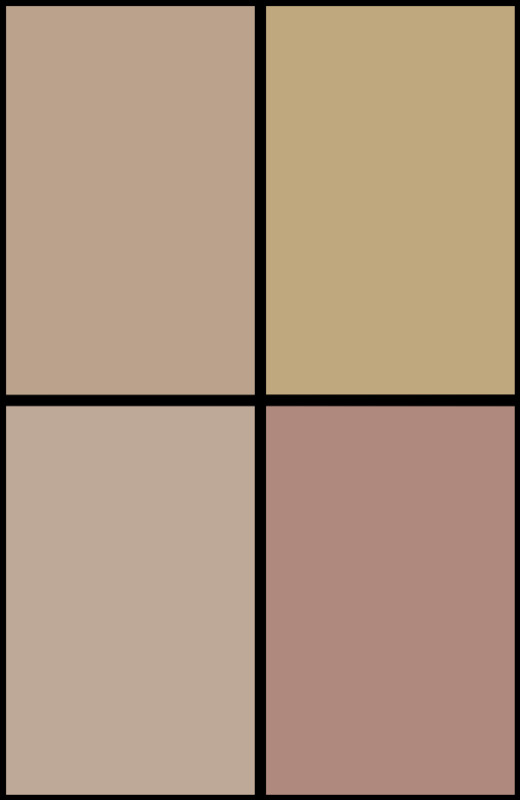 In the desert, where there are several grounded S.H.I.E.L.D. Helicarriers, Captain America meets up with Linda, who seems to have made some progress. Agent Preston is back in semi-working order, and she agrees to join Cap in taking care of Deadpool… permanently. All of this “concludes” next issue. We jumped onto Despicable Deadpool without reading the previous Deadpool run or Secret Empire, but after just a few months, we’ve gotten a decent grasp of what’s going on. That’s the mark of a successfully executed monthly comic book, so bravo on that front. The decompression in Despicable Deadpool, however, may be the worst of all the X-books. Perhaps the reboot will do it some good?